Rajasthan High Court Civil Judge Answer Key Check Here. Rajasthan High Court Civil Judge Admit Card Check Here. Rajasthan High Court Notification is out. Rajasthan High Court is recruiting for 197 Civil Judge Govt Job Posts. 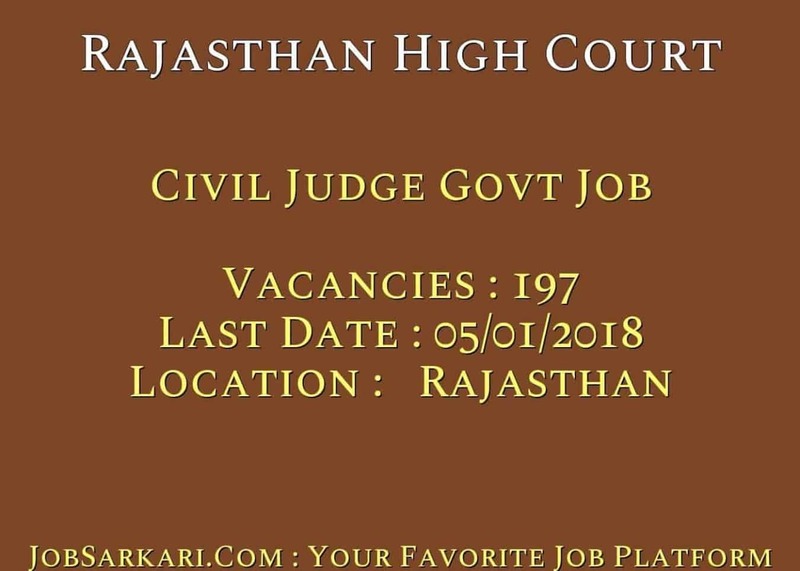 You can check Rajasthan High Court - Rajasthan High Court last date, download Rajasthan High Court notification, visit Rajasthan High Court official website and check other Rajasthan High Court Vacancy details.Complete Vacancy and recruitment Details about 197 Civil Judge Govt Job vacancies in Rajasthan High Court are provided below by JobSarkari.Com only for you. Last Date for Apply Online 05/01/2019. Last Date for Payment of Fee 06/01/2019. Gen/ OBC/ BC/ Othe states Rs.850/-. OBC/ BC Candidates of Rajasthan Rs.550/-. SC / ST / PH Rs.300/-. Mode of Payment Application fee Can be Submitted through Online Mode. Civil Judge 103 41 30 23 197. Candidate Must Have Passed Bachelor Degree in Law and Must Have Knowledge of Hindi Language / Rajasthani Dialects and Social Custom of Rajasthan(Candidate Appearing in the Final Semester are Also Eligibile to Apply). 4.Upload the Scanned Copy of Required Documents in the Prescribed Size and Format. 5.Take Printout of Your Application Form for Future Reference. 6.Online Application Can be Submitted on or Before 05th January 2019. Q. 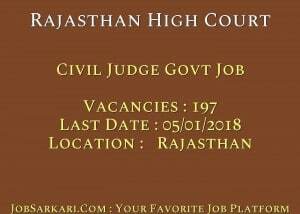 What is the Last Date For Rajasthan High Court Civil Judge Govt Job Vacancy ? A. Last Date for Rajasthan High Court Civil Judge Govt Job Posts is 05/01/2019. Q. What is the Form Type of Rajasthan High Court Civil Judge Govt Job Recruitment ? A. The Form Type for Rajasthan High Court Civil Judge Govt Job Posts is Online. Q. How many vacancies are available in Rajasthan High Court Civil Judge Govt Job Posts ? A. There are about 200 Vacancies in Rajasthan High Court Civil Judge Govt Job Posts. Q. What is the Full Form of Rajasthan High Court ? A. Full Form of Rajasthan High Court is Rajasthan High Court .